(Bloomberg) With $2.7 billion in oilfield sales this week, Hess Corp. is making a calculated bet, giving up steady production today to help fund what could be one of the world’s biggest discoveries into the next decade. 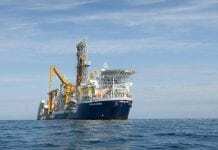 The oil explorer with operations on five continents said Tuesday that it’s selling North Sea assets off of Norway for $2 billion and seeking a buyer for wells off of Denmark. The news came a day after Hess sold drilling rights in offshore Equatorial Guinea for $650 million. Counting a June deal to sell properties in Texas, the New York-based company has sold off almost $3.3 billion in assets this year. 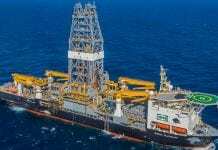 With the makeover, Hess is building a war chest to help develop a discovery off the coast of Guyana in South America that may hold the equivalent of 2.5 billion barrels of oil, according to company estimates. Its partner in the project, Exxon Mobil Corp., has said the initial building phase may cost $4.4 billion and take until 2020 to deliver its first oil. The payoff: More than a decade of growth for Hess shareholders. Still, there’s a trade-off, Johnston said. Hess is giving up operations that produced 16 percent of its total oil volumes and almost a quarter of its earnings before interest, taxes, depreciation and amortization, he said. Hess is due to announce its third-quarter earnings on Wednesday. After opening the day up, the shares fell 2.4 percent to $44.14 at 12:34 p.m. in New York trading. Before Tuesday, the shares had fallen 27 percent for the year, putting them among the ten worst performances on the S&P 500 Energy Index. Hess had telegraphed its North Sea sales, so investors may have discounted some of the gains, said Charles Robertson, a Cowen & Co. analyst in New York. 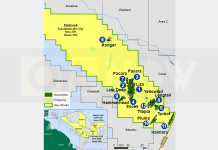 The total sales proceeds are also more than the explorer’s projected share of the Guyana project and some may question whether the company was selling too much, he wrote in a research note. Hess has estimated that its share of the project’s initial phase will be about $1 billion. 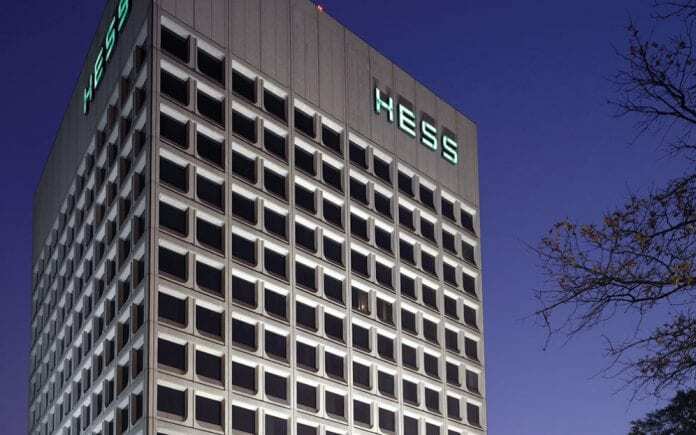 Hess, in a statement, said there would be other benefits: $500 million of the proceeds will be used to retire debt next year and the company also gets to cancel $3.2 billion in liabilities for closing and cleaning up the operations it’s selling. Hess also announced a goal of cutting $150 million in annual expenses, a plan that will lower its per-barrel production costs 30 percent by 2020, it said. “We are focusing our portfolio on higher return assets and reducing our break-even oil price,” said Chief Executive Officer John Hess.